China is a country filled with unexpected surprises. The warm welcome from the people, the beauty of the landscape and the sheer size and scope of the cities has made China one of the PlanetD's favourite destinations. This China travel guide will help you plan your next vacation. Chinese power voltage is 220 V 50Hz; Plug A, I & G.
Toilet paper is rarely found in public restrooms; carry your own sanitary napkins just in case nature calls. The internet is censored in Chine. You need a VPN to use most social media sites. Layers – The general rule of thumb is to pack at least four layers: a base layer, long sleeve shirts, a fleece (mid-layer) and a top layer such as a windbreaker (waterproof!). Base layers should be make of wool or synthetic fabrics as they often offer superior moisture-wicking and temperature control protection than cotton. Avoid White – smog is a big issue in many Chinese cities so this means that white clothes get dirty quicker than normal. Avoid Jumpsuits (or tight pants)– squat toilets are quite common in particular Chinese areas. As a result, wearing any form of tight pants or jumpsuits will make a travelers trip to the bathroom infinitely more difficult. Tampons – tampons aren't easy to find in China and unless you are a fan of pads than makes sure to stock up before you go on your trip. Go Rock Climbing – When visiting the world's greatest Karst formations in Yangzhou, why not try your hand at rock climbing? We promise you won't regret it! Bamboo Rafting Down the Li River – a visit to the Yangshuo would not be complete without a bamboo cruise on the Li River. Fine Your Inner Chef at Yangshuo Cooking School – learn about Chinese cooking and gain a new appreciation for their fine cuisine. See the Ghost City of Fengdu – pass three tests in order to be deemed innocent and pure of heart and be allowed to enter the city's 600-year-old temple. Enjoy a Sizzling Night Out – the Sichuan Province is known as the province of flavor and is famous for its over the top spices. Shanghai Acrobats – watch some of the finest acrobats in the world in one of China's most vibrant cities. Try Hot Cupping…. If you Dare – originating in China, hot cupping is meant to draw out toxins from the body and muscles. Visit Tiananmen Square – walk around the world's largest public square, the location of the infamous 1989 massacre. 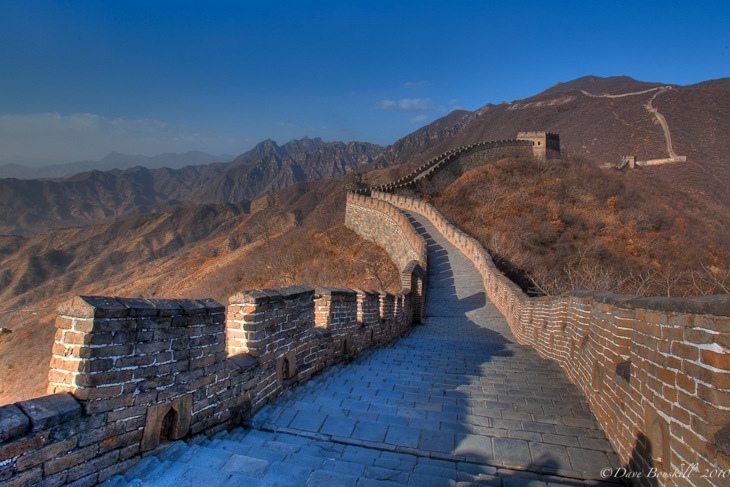 Visit the Great Wall of China – visit the mother of all China's tourist destinations. See our Travel Video of the Great Wall here. Watch Panadas at Chengdu – visit the Giant Panada Research Base to watch these magnificent creatures from up close. Explore the Yangshuo countryside by bike – visitors come to Yangshuo for the scenery and there is no better way to witness it than from the vantage point of a bicycle. Take in the Skyline from the Bund – the Bund of the Shanghai Skyline offers one of the most spectacular views in the world. A Good Day in Xi'an – there is much more to see in Xi'an than the Terracotta Warriors. This city is worth a visit in it's own right. Terracotta Warriors; Are the Real of is it Memorex?